Yeah, but: Every home can use one. It makes a great gift. The Long Version: I have to admit that this is an embarrassing review to write. It's even more embarrassing that this is something that I've only owned for about a week; this is the sort of product that looks like a forlorn fugitive from the `80's and should have fallen out of a box while I was cleaning up the garage. But no, I bought it from a massive office supply chain that won't even condescend to list the Sort`N Bank on its website, for the low-low price of $16 - and change. Naturally. The Sort'N' half works, but the Bank part is problematic. It doesn't have a massive capacity; lots of coins will choke the screens and need to be cleared away. I had hopes that this would become an easy storage place for all of the change that I accumulate, but it's not up to that task. I guess Sort N Put The Coins Somewhere Else wasn't as catchy a name. Or perhaps the trademarkable abbrevation is supposed to be short for 'SortING Bank', not "Sort AND Bank'. If only the inventor had included his Hotmail address on the product so that I could resolve this mystery. The amount of change in these photos is about all the trays can handle without being completely clogged, but smaller amounts are sorted easily. It's great at sorting the wheat from the chaff when I empty out my pockets, leaving the valuable stuff on top for easy re-use and sending the lesser denominations to the bottom for recycling or landfill. Just don't toss the change down with a flourish: the trays are a little bouncy, ruining the dramatic effect of the gesture. Using screens to sort items according to size isn't a new idea. What US Patent 359832 details is an ornamental coin basket with no claims about a sorting ability. And it is decent desk-candy, provided you have room beside your pin-art and Newton's clicking balls. Just tell yourself that its occasional need to be picked up and shaken vigorously is a substitute for dusting. The "As Seen On TV" sticker does not disappoint. The TV spot for the Sort N Bank is classic cheese, and is not to be missed. (I'd like you to see that again.) The ad fails to highlight one of the reasons to own this product - instruction step #2 is "Shake Unit" - but the voice-over and hand model is a woman, and Penny tells me that that's a joke that only guys find funny. But since the Sort'N Bank is something that can only be purchased and used with a certain level of tongue-in-cheek irony, I'm not about to apologize when my sense of humour turns juvenile. 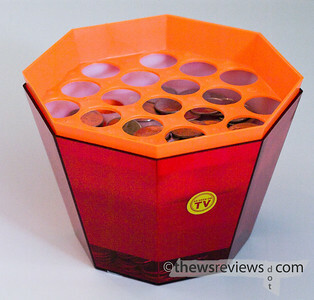 But wait, there's still more (updated June 2009): The biggest weakness in the design of the Sort'n'Bank is that the tray to screen the pennies from the dimes is at the smallest end of the inverted pyramid. It has the lowest capacity, but pennies are very common; the holes to sort out the dimes need to be nearly the same size as pennies, so they clog very easily. 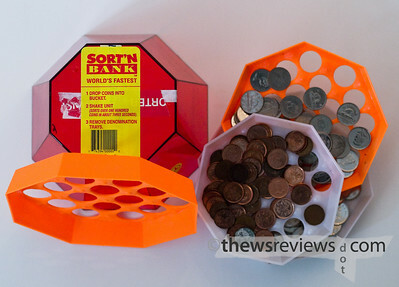 My solution has been to use the Sort'n'Bank without the bottom tray, so that pennies and dimes fall to the bottom, and then use a magnet to separate them later. Leave the magnet in the bottom and most of the sorting will already be done. It's like magic. The only catch is that some of the recent Canadian pennies are made from steel instead of copper, so they need to be separated from the dimes by hand. Still, it mostly works. And since the metal value in a copper penny exceed its face value, maybe it's not such a bad distinction to make. I just bought one of these and sorted over $1000 in change on the weekend.. It works amazingly!! I give it a 4 star ratiing..